Calculate by QxMD carries the same level of finesse and finish as its impressive partner apps. The switch to Android has not had any negative effects. 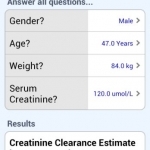 This is an impressive medical calculator app which, with a free price tag, should appeal to all healthcare professionals who use an android phone.